Published Nov 9, 2015 by Pearson IT Certification. Part of the LiveLessons series. More than 21 hours of video training covering all of the objectives in the CCNA Wireless WIFUND 200-355 exam. Includes 240 interactive practice quizzes, 12 glossary quizzes, and 24 dynamic hands-on exercises and multi-step simulations so you can practice what you learn and assess your skills. 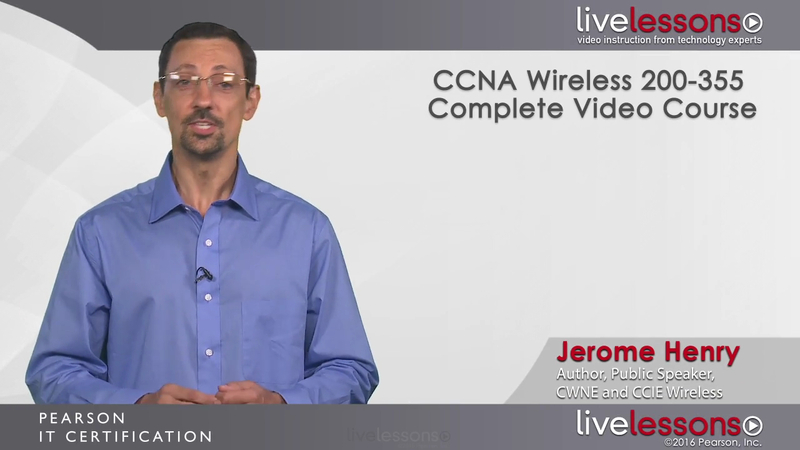 The CCNA Wireless 200-355 Complete Video Course is a unique video product that provides users with more than 21 hours of personal, visual instruction from wireless expert and instructor Jerome Henry. Video lessons cover all objectives on the CCNA Wireless; WIFUND 200-355 exam. With 240 practice questions, 12 glossary quizzes, and 24 dynamic hands-on exercises and simulations, the CCNA Wireless 200-355 Complete Video Course offers you everything you need to study for and pass the exams. CCNA Wireless 200-355 Complete Video Course contains 12 modules, subdivided into 50 lessons and 210 sub-lessons, for a total of more than 21 hours of instruction. The videos consist of audio instruction and animations. Each video presents detailed objectives and video captures. Audio instruction throughout offers detailed explanations and tips. Interactive exercises and quizzes are also included in this title. Streaming – Watch instantly as the video streams online in real time; after purchase simply click “Watch Now” to get started. Download – Download video files for offline viewing anytime, anywhere; after purchase simply click the download icon within the player and follow the prompts. Wi-Fi networks use radio waves, and you cannot understand Wi-Fi without understanding radio waves. This module covers the fundamentals of radio communications: how waves are transmitted, what they look like, what can affect them as they travel between your AP and wireless clients, but also how you measure them in terms of frequencies and power, so as to know what kind of performances your Wi-Fi clients might be able to get. At the end of this module, you will know about the multiple frequency bands where Wi-Fi can operate, but also the differences in regulations from one country to the next. You will also be able to read an antenna radiation pattern chart; to understand where your signal is going to propagate. You cannot see RF, so we built this module to give you as many practical analogies as possible, to help you sense how waves operate, even if you can’t see them. Wi-Fi uses RF signals. As soon as these signals leave your antenna, they get affected by the environment. This lesson looks at RF propagation, how a wave moves from one place to another. To understand waves, we will first look at how a wave is described and its characteristics. We will then look at what happen to that wave as it moves. You will be able to use this information not only for Wi-Fi designs, but also to understand the characteristics of any radio transmissions, from cellular to radio or TV. Don’t fear, this is not a dry math lesson! Of course, math is the heart of physics, and Wi-Fi follows the laws of physics…and you need to follow them to understand how much power your access point is allowed to inject into its antenna and how far your signal can go if you use this or that antenna. So this lesson aims at giving you mental math shortcuts that will prove useful when you need to compare antennas, compare cells, compare signals at different frequencies, or even compare the performances of clients. After you understand the basics of RF propagation, you soon realize that the energy the wireless clients receive is very faint. This lesson will help you understand how the received energy is measured, and how it is compared to the environmental noise. This will help you evaluate the possibilities of various Wi-Fi client types, from laptops to phones or tables. With this information in hand, you will be able to better build a wireless cell that provides an optimal signal for all the clients you intend to include. Most access points come from a default antenna, that translate in a cell of a particular shape and size. But changing the antenna allows you to modify that shape, to provide coverage in specific areas, while isolating your system from neighboring signals. Choosing the right antenna implies understanding antenna types and characteristics. This lesson will help you master the radiation patterns used by antenna vendors to describe their antennas. This lesson will also help you choose the right antenna for the right type of coverage, while making sure that you respect the rules of maximum radiated signal strength. ITU, IEEE, WI-FI Alliance, FCC, ETSI...many organizations have roles that influence what your access points and wireless clients can send and receive. This lesson will help you navigate the role of these organizations. At the end of this lesson, you will have a clear understanding of what frequencies and powers are allowed for Wi-Fi, who decided of these rules, and how these different organizations interconnect to determine what your Wi-Fi network can and cannot do. Now that you understand radio waves, it is time to give a closer look at Wi-Fi-specific transmissions. There are multiple ways of transmitting 0s and 1s in a radio wave. In this module, you will learn the choices that the 802.11 designers have made for such transmissions. You will learn how Wi-Fi transmits data, but also all the accompanying frames and mechanisms behind these transmissions. This module will help you understand why Wi-Fi works, why (sometimes) it does not work, and the reasons behind Wi-Fi transmission possibilities and limitations. You will read everywhere that Wi-Fi uses Spread Spectrum transmissions—what does this mean? There are several ways to represent 0s and 1s in a radio wave, each with its advantages and limitations. In this lesson, you will learn the techniques that Wi-Fi uses. This knowledge will help you understand why and how data rates are related to distance, but also why Wi-Fi can bond channels together. You will be able to use this knowledge to decipher terms behind 802.11ac, such as MU-MIMO and channel reuse. Now that you understand Wi-Fi transmission, it is time to connect devices to one another. In this lesson, we will explore the different Wi-Fi topologies: direct connections through ad-hoc and Wi-Fi direct, but also infrastructure mode and all its associated terms—SSID, BSSID, MBSSID, DS, ESS. At the end of this lesson, you will also understand the various roles that access points and stations can play in a wireless choreography, including bridging, mesh, and repeater roles. Access points and stations can send frames whenever they need, but Wi-Fi has some rules in place to avoid, as best as possible, frame collisions in the air. In this lesson, you will learn the access methods behind Wi-Fi transmissions, and the various frames in place to avoid smooth communications. You will also learn the challenges of implementing decentralized access methods, and why this implementation choice not only made the success of Wi-Fi, but also created fundamental incompatibilities with other technologies, for example with LTE. In the 15 years of Wi-Fi development, one primary effort was to increase transmission speeds. This is how amendments like 802.11b, 802.11g, 802.11a, 802.11n, 802.11ac or 802.11ax were developed. In this lesson, you will learn what these amendments bring to Wi-Fi communication, but also what issues and limitations new protocols bring to the older ones. You will also learn other enhancement techniques, such as MIMO, MU-MIMO, MRC, spatial streams and beamforming. Site surveys are at the heart of Wi-Fi deployments. As a CCNA, you may not be expected to plan and design for large deployments without support, but you are definitely expected to understand what site surveys are and how (if) they are done. This module will give you the tools you need to be proficient with site surveys, covering the various techniques at your disposal, the various requirements for standard deployment types, and also browsing to the site survey tools available for offsite and onsite surveys. Each survey type typically follows a standard process, built over years of shared experience and best practices from thousands of professionals worldwide. But a survey is nothing if you do not have clear performance objectives for your Wi-Fi coverage. This lesson will help you determine the type of cell you want to build, if you are designing for simple data traffic, or for voice, high bandwidth real time applications, high user density, or even location-based services. Do you actually need to perform a site survey? And if so, what kind of site survey would you perform? It all depends on the phase of the deployment you are addressing. In this lesson, you will learn about the various phases in Wi-Fi deployment, and you will learn, for each phase, what type of survey can be performed and to achieve what purpose. This will help you determine if your network requires a site survey, or if it was properly designed. Once you understand the site survey techniques and cell performance requirements, you need to choose one or several site survey tools. This lesson will give you an overview of the various tools available for each type of survey. Each tool is typically built for a specific purpose, giving it strengths and also limitations. This lesson will help you choose the best tool(s), to provide the information you need for each phase of your deployment. At this point of your Wireless CCNA journey, you understand radio waves, the specifics of 802.11 transmissions. You understand how to build a Wi-Fi cell, from the antenna choice to powers and performance requirements for each type of deployments. You also know how to perform a site survey to achieve these performance goals. It is time to add wireless clients to your design. But before doing so, you need to make sure that your network is secure. Wi-Fi has long been plagued by a reputation of being insecure. This reputation is undue, if you take the proper steps to apply modern security techniques to your cell… but your network can be a disaster if you apply techniques that are still available, but were designed for older networks. This module will provide you with the knowledge you need to apply proper Wi-Fi security, and make your Wi-Fi network more secure than most wired networks. Security is achieved by applying a combination of factors that work together, from authentication to encryption, but also attack detection and prevention. Not all factors are needed for all networks. This lesson will guide you through the different elements of Wi-Fi security to help you chose the bricks you need to make your network secure, without gaps and also without any security excesses that create burden for your users or the wireless administrator, without adding a security layer that would be useful for the network you deployed. Authentication is the first phase you need to implement Wi-Fi security. However, it is quite a complex one, because there are many different possible techniques, each providing a different quality of security. To make things worse, not all clients and not all infrastructure support the same authentication techniques. This lesson will help you sort the various techniques, to understand how they work, what security confidence they can bring, and what support you can expect from the various types of clients and Cisco network deployments. Wi-Fi signals can travel far beyond the limits of your walls, and be captured by unwanted listeners. Therefore, a key to wireless security is to encrypt traffic. But just as computing technologies have evolved a lot over the last 15 years, Wi-Fi encryption technologies have also changed dramatically. This lesson will guide you through the modern encryption techniques that you need to implement, will help you recognize the obsolete technologies that should be avoided, and will also give you glimpse on what future technologies may bring to your network security. It is now time to dive into Cisco wireless networks. Each network is a unique combination of needs, constraints and possibilities, and there are several wireless network types. As a CCNA Wireless, you are expected to be able to manage these networks, and also understand what deployment choice was made, and the reasons behind this choice. This module will help you navigate through the various components of wireless networks, and will also help you understand the various wireless architectures available today. You will also learn the common components of these architectures, in terms of management, security or protocols. You will also learn how to determine key elements of your deployment and configuration, such as channel plan, power or QoS management. There are all sorts of ways to build a wireless network, depending on the physical environment, the business requirements, the client types, the expected performances, but also the management needs. For these reasons, Cisco distinguishes 5 deployment types that you need to master. This lesson will guide you through these different types, and will also help you understand how these networks are managed and secured. Your wireless access points need to connect to switches. You may also implement Wireless LAN controllers to control these access points, creating an overlay to the wired infrastructure. You need to understand how the wireless infrastructure interacts with the wired infrastructure. This lesson will help you understand the various elements of the wireless infrastructure, from split MAC, control and data traffic, to Mobility Controller and Mobility Agent, and will also help you understand how switches and routers should be configured to interact with your wireless infrastructure. Security is key to wireless deployments, and this lesson will detail two security protocols that you need for your wireless networks management: TACACS and RADIUS. You will also learn the basics of Cisco Identity Services (ISE), the tool of choice to manage the secure access of your wireless users and devices. In small networks, you install access points. In larger networks, you also install Wireless LAN controllers to reduce the management touch points. When your network contains several Wireless LAN controllers, you may also need to centralize their management. This lesson will guide you through the principle of Cisco Prime Infrastructure, the management tool of choice for networks that use Wireless LAN controllers. RRM is one of the most central concepts in controller-based architectures, and you are expected to understand it well. In this lesson, you will learn what RRM does and why it is there. You will see how RRM controls AP channels and power, with DCA and TPC, but will also look more closely at the edge of the cell, where clients may be suffering, and will see how Coverage Hole Detection can help them. There are more enhancements to the RF side of the network than just RRM. So in this lesson, you will learn about three additional RF enhancement features that you want to know about: first CleanAir, to detect and mitigate sources of interference; then BandSelect, to push your clients to the best band; and last ClientLink, to improve the signal for your client at the edge of the cell. Roaming seems to be easy: you take your BYOD, and move: as your BYOD jumps from one AP to the next, you are roaming. The process is more complicated if you want this roaming to happen without loss of connection, which is the focus of this lesson. You will see what happens when you roam between autonomous Aps. A few things can be done here to make the roaming experience seamless, but there are limitations. So this will bring us back to the controller-based networks, where we have more possibilities. There, you will learn the various ways APs, switches, and controllers can be grouped together to form areas where roaming has to be frequent, and therefore very efficient. Once you understand this grouping logic, all you will have to do is look at where roaming happens, and what names roaming receives depending on how and where it happens. You will use those names every day when managing Wi-Fi networks. You will also see the exchanges that happen when a wireless device first joins an AP. This will allow you to understand what additional exchanges are needed to bring seamlessly that device session from one AP to another. This module will focus on autonomous access point configuration. You will learn how to access and manage these APs, and you will also learn the steps needed to properly configure a WLAN, its various security options, the AP RF parameters and also some advanced options that are needed for optimal performance. In this lesson, you will learn the various possibilities to access and configure your access point, over the air or over the wired network. You will also learn the steps you need to perform an initial configuration. Configuring a WLAN on an autonomous access point is a series of steps that have to be performed in the right order… if you want your configuration to work. The sequence is a bit different depending on the type of WLAN you need to configure. This lesson will guide you through the various configuration steps you need for different types of WLANs, from simple to complex. Some advanced options are present in the autonomous AP interface. As a wireless CCNA, you do not need to be an expert, but you need to understand and be able to configure some of these options to optimize your access point performances, such as ClientLink or BandSelect. This lesson details these advanced options and shows you how to configure them. With the acquisition of Meraki, Cisco now offers Cloud-managed access points. Although the RF fundamentals are the same for all Wi-Fi networks, the Cloud management interface, the logic of the networks and the way they are managed is different from what you are used to, if your background is on-premise WLAN. This module will give you the information you need to face any Cloud Wi-Fi exam question or deployment case, and understand the interface and the options that were chosen. Cloud managed access points do not have console ports… so how do you initialize the access point? What do you do if the AP does not appear on the cloud management interface? This lesson will guide you through the AP initialization steps, and will also help you navigate the Cloud Management tool. The Cisco Meraki access point has a lot of options for WLAN configuration. This lesson will guide you through the various choices for authentication and encryption. This lesson will also help you navigate through the different WLAN optimization options. As the access points are managed from the Cloud, you can decide if power and channels should be statically defined or dynamically assigned from the Cloud as RF condition changes. Some access points also embark an additional radioed dedicated to RF monitoring and optimization. This lesson will guide you through the various RF parameters available on the cloud management tool to optimize your network RF performances. The Cloud management tool offers many advanced features. Some of them only make sense for very specific deployment, but some others may be of interest for most deployments, and may help you bring additional control or enhance the services offered by your wireless infrastructure, like location tracking or presence analytics. This lesson will guide you through these more advanced options, to help you choose the ones that may help you better manage your network. Centralized Wireless Implementations use WLAN controllers, and they are at the heart of the body of knowledge needed for the WLAN administrator. In the world of WLAN controllers, you may face appliances running the AireOS, and other running the IOS XE operating system. The items you configure may be the same for both operating systems, but the way you configure them may be different. This module will help you understand both platforms, then focus on AireOS to configure the controller, its access points, WLANs, mobility parameters, and also explore more advanced options for Wi-Fi network optimization. The first step in your WLAN deployment is to configure a controller. The configuration steps will be different if you use an AireOS or an IOS XE controller. This lesson will show you how the initial setup is done on AireOS, how you can access the controller via CLI or web interface, and will also help you navigate the GUI that you may be facing while working with AireOS. How do APs find their controller? This is a key question to answer for any centralized system. There are in fact three distinct phases that you need to master well. So in this lesson, you will learn all the AP has to do in the discovery phase, to discover as many controllers as it can. You will then learn how an AP chooses and joins a controller, then how the AP receives its configuration from the controller. An AP can be in different modes while on a controller. These modes have different functions, and different characteristics. This lesson will teach you these modes and what they do, starting with the local mode, and the monitor mode. You will also learn about the other modes: rogue detector, sniffer, and bridge, before spending a few minutes on the FlexConnect mode. This one is important, and this course an entire module dedicated to what happens when an AP is in this mode. At this point of the course, you should know about RRM, what it is, and what it does. This lesson will show you how you configure RRM on the AireOS controllers and will also show you the different extended options that are available to fine tune RRM behavior. One complexity of controllers is that the WLAN configuration menu contains many options, most of them also related to other parameters configured in other sub-menus of the controller. This lesson will help you navigate the WLAN configuration, and understand what options provides what feature. This lesson will help you make sure that your WLANS implement the right options, so as to provide a secure, but also stable coverage for your wireless clients. Mobility is the action of moving from one AP to another, without loss of session or connection. This movement can imply complex interactions when it happens between access points connected to different controllers in different subnets. This lesson will introduce the concept of L2 roaming, L3 roaming, SPG, MA, MC, and mobility groups. You will learn the role that each of these elements play in the roaming choreography, and how to configure your controllers to isolate APs from one another, or to provide a seamless roaming experience where it is needed. Once your centralize controller is configured for WLAN, security and RF optimizations, you will realize that there are options left that provide an even finer control on your wireless cell and its client. For example, you can implement application visibility and control, to provide different bandwidth to your users based on the application they use. You can also recognize the client devices, and provide a different service to Android than Apple devices, or even different bandwidth to Windows 7 than to Windows 10 devices. This lesson will help you configure these advanced options. FlexConnect access points offer a flexible compromise between centralization and autonomous settings. FlexConnect APs can be configured from a central controller while still behaving like autonomous APs whenever needed. This module will help you understand how FlexConnect APs behave, and configure them to communicate through the controller whenever needed, while saving bandwidth when controller communication is not needed. FlexConnect APs, like all CAPWAP APs, have both a control plane and a data plane component. In this lesson, you will learn what communication modes are available for each plane. Once you know what information FlexConnect APs transmit, and where they can transmit it, you are ready to move to the Configuration phase. This lesson will show you how to configure FlexConnect APs to send to the controller traffic that needs to be centrally monitored or managed, while keeping local traffic that needs to survive loss of connection to the main controller. In some cases, several FlexConnect APs need to function together, to commonly manage client authentication or encryption parameters while roaming, or even coordinate actions such as image upgrade or rogue control. This lesson will show you how to configure FlexConnect groups, and will teach you the various parameters that can be shared at the scale of the group. In a converged access implementation, wireless and wired networking devices collapse, and your wired Layer 3 switch becomes a Wireless LAN controller for access points connected locally. In that case, the controller is a function of the Cisco IOS operating system. This module will provide the information you need to configure that function, but also ensure seamless roaming between access points connecting to different switches. You will also learns the specifics of converged access topologies, and the differences between Converged Access and Centralized modes. Just like for centralized topologies, your first step in Converged Access management is to initialize the Wireless Controller Module (WCM) function on the switch. This lesson will show you how you can access the WCM on a switch, how the initial WCM configuration is performed, but will also show you how access points can be set to join the local controller or another controller. You will also learn about the AP license options, and the AP modes available on Converged Access switches. Because each switch in your wiring closet can be a controller for wireless Access Point, RF management on Converged Access is a delicate exercise of balancing what has to be local to each switch with functions that should be common to all switches hosting APs in the same RF environment. This lesson will show you which functions are local and which functions are centralized, and will also teach you how to configure efficient RF management on Converged Access. Configuring a WLAN on Converged Access systems is close to the same configuration on Centralized controllers. However, there are some key differences. This lesson will guide you through the steps needed to configure, secure, and configure advanced WLAN options for your Converged Access controller. Mobility is a key field where differences between Centralized and Converged Access architectures are striking. Converged Access introduces key different additional concepts to ensure efficient roaming. This lesson will help you navigate through the additional concepts related to roaming on Converged Access controllers, and will show you how to configure efficient roaming parameters. Just like on Centralized controllers, you will learn in this lesson how to configure additional options, such as Application Visibility and Control, local device profiling. You will also learn how to configure automatic options that are more specific to Converged Access controllers, like Lobby load balancing. Once your wireless infrastructure is configured, wireless clients can connect. As a CCNA Wireless candidate, you are expected to be able to configure most common client operating systems for wireless connection. This module will show you most client interfaces and the configuration steps needed to associate to all types of wireless networks. Most operating systems offer common options for initial configuration choices: are you associating to a broadcasting SSID? Creating a profile for ad-hoc connections? Is it a Personal or Enterprise network? This lesson will show you the logic of these different initial configuration choices of most standard operating systems. This lesson will guide you through the steps needed to configure simple and advanced WLAN parameters on classical operating systems: Windows, MAC OS, Apple IOS, and Android. As a CCNA, you do not need to drill into complex troubleshooting tasks, but you are expected to know how to maintain your systems, managing image upgrades and configurations, and be on the front line when things go wrong. When clients can’t connect, when communications fail, when your APs are in trouble and can’t find their controller, you should know where to look and what to look for. This module will help you get started on this task. I will tell you about the various troubleshooting methods you can use, and also go through the common elements that easily go wrong in a wireless network. It won’t solve everything, but it will get you comfortable with most common cases. In this lesson, you will learn to upgrade or downgrade the code of your wireless access points and controllers. The procedures are not identical for autonomous APs, cloud-based APs, IOS XE, or AireOS. This lesson will cover them all. As someone who is CCNA Wireless certified, you also need to be able to backup and restore the configurations of your systems. This lesson will show you the procedures for configuration management on autonomous APs, on cloud systems, on IOS XE, and AireOS controllers. When things go wrong, and access points or wireless clients display a problematic behavior, you have to know where to look, in order to find clues to solve the troubleshooting puzzle. This lesson will help you navigate the troubleshooting tools at your disposal, and understand what information each of these tools can bring. Each issue is unique, but many common issues repeat from one network to the next. In this lesson, you will learn common approaches to troubleshooting. We will also examine together common issues that can prevent access points from properly joining controllers, wireless clients from authenticating or roaming.